The Berlin Conference of 1884–85, also known as the Congo Conference (German: Kongokonferenz) or West Africa Conference (Westafrika-Konferenz), regulated European colonisation and trade in Africa during the New Imperialism period, and coincided with Germany’s sudden emergence as an imperial power. Called for by Portugal and organized by Otto von Bismarck, first Chancellor of Germany, its outcome, the General Act of the Berlin Conference, can be seen as the formalization of the Scramble for Africa. The conference ushered in a period of heightened colonial activity by European powers, while simultaneously eliminating most existing forms of African autonomy and self-governance. Prior to the conference, European diplomacy treated African indigenous people in the same manner as the New World natives. By the mid-19th century, Africa was considered disputed territory ripe for exploration, trade, and settlement. With the exception of trading posts along the coasts, the continent was essentially ignored. This changed as a result of King Leopold of Belgium’s desire for glory. In 1878, King Léopold II of Belgium, who had previously founded the International African Society in 1876, invited Henry Morton Stanley to join him in researching and “civilizing” the continent. In 1878, the International Congo Society was also formed, with more economic goals, but still closely related to the former society. Léopold secretly bought off the foreign investors in the Congo Society, which was turned to imperialistic goals, with the African Society serving primarily as a philanthropic front. From 1878 to 1885, Stanley returned to the Congo, this time not as a reporter, but as an envoy from Léopold with the secret mission to organize what would become known as the Congo Free State. French intelligence had discovered Leopold’s plans, and France was quickly engaging in its own colonial exploration. French naval officer Pierre de Brazza was dispatched to central Africa, traveled into the western Congo basin, and raised the French flag over the newly founded Brazzaville in 1881, in what is currently the Republic of Congo. Finally, Portugal, which already had a long, but essentially abandoned colonial Empire in the area through the mostly defunct proxy state Kongo Empire, also claimed the area due to old treaties with its old proxy, the Kingdom of Spain, and the Roman Catholic Church. It quickly made a treaty with its old ally, the United Kingdom of Great Britain and Ireland on 26 February 1884 to block off the Congo Society’s access to the Atlantic. By the early 1880s, due to diplomatic maneuvers, subsequent colonial exploration, and recognition of Africa’s abundance of valuable resources such as gold, timber, land, markets and labour power, European interest in Africa had increased dramatically. Stanley’s charting of the Congo River Basin (1874–77) removed the last bit of terra incognita from European maps of the continent, thereby delineating the rough areas of British, Portuguese, French, and Belgian control. The powers raced to push these rough boundaries to their furthest limits and eliminating any potential local minor powers which might prove troublesome to European competitive diplomacy. France moved to occupy Tunisia, one of the last of the Barbary Pirate states under the pretext of another Islamic terror and piracy incident. French claims by Pierre de Brazza were quickly solidified with French taking control of today’s Republic of the Congo in 1881 and also Guinea in 1884. This, in turn, partly convinced Italy to become part of the Triple Alliance, thereby upsetting Bismarck’s carefully laid plans with Italy and forcing Germany to become involved. In 1882, realizing the geopolitical extent of Portuguese control on the coasts, but seeing penetration by France eastward across Central Africa toward Ethiopia, the Nile, and the Suez Canal, Britain saw its vital trade route through Egypt and its Indian Empire threatened. Under the pretext of the collapsed Egyptian financing and a subsequent riot which saw hundreds of Europeans and British subjects murdered or injured, the United Kingdom intervened in nominally Ottoman Egypt, which, in turn, ruled over the Sudan and what would later become British Somaliland. Owing to the upsetting of Bismarck’s carefully laid balance of power in European politics caused by Leopold’s gamble and subsequent European race for colonies, Germany felt compelled to act and started launching expeditions of its own which frightened both British and French statesmen. Hoping to quickly soothe this brewing conflict, King Leopold II was able to convince France and Germany that common trade in Africa was in the best interests of all three countries. 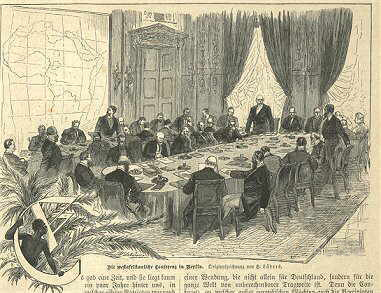 Under support from the British and the initiative of Portugal, Otto von Bismarck, German Chancellor, called on representatives of Austria-Hungary, Belgium, Denmark, France, the United Kingdom, Italy, the Netherlands, Portugal, Russia,Spain, Sweden-Norway (union until 1905), the Ottoman Empire, and the United States to take part in the Berlin Conference to work out policy. However, the United States did not actually participate in the conference both because it had an inability to take part in territorial expeditions as well as a sense of not giving the conference further legitimacy. To gain public acceptance a primary point of the conference was the ending of slavery by Black and Islamic powers. Thus, an international prohibition of the slave trade throughout their respected spheres was signed by the European members. It was primarily because of this point that Joseph Conrad sarcastically referred to the conference as “the International Society for the Suppression of Savage Customs” in his novella Heart of Darkness. The Congo Free State was confirmed as private property of the Congo Society thereby ensuring that Leopold’s promises to keep the country open to all European investment was retained. Thus the territory of today’s Democratic Republic of the Congo, some two million square kilometers, was made essentially the property of Léopold II (but later would eventually become a Belgian colony). A Principle of Effectivity (see below) was introduced to stop powers setting up colonies in name only. Any fresh act of taking possession of any portion of the African coast would have to be notified by the power taking possession, or assuming a protectorate, to the other signatory powers. The first reference in an international act to the obligations attaching to “spheres of influence” is contained in the Berlin Act. The principle of effective occupation stated that powers could acquire rights over colonial lands only if they actually possessed them: in other words, if they had treaties with local leaders, if they flew their flag there, and if they established an administration in the territory to govern it with a police force to keep order. The colonial power could also make use of the colony economically. This principle became important not only as a basis for the European powers to acquire territorial sovereignty in Africa, but also for determining the limits of their respective overseas possessions, as effective occupation served in some instances as a criterion for settling disputes over the boundaries between colonies. However, as the Berlin Act was limited in its scope to the lands on the African coast, there were numerous instances where European powers claimed rights over lands in the interior without demonstrating the requirement of effective occupation articulated in Article 35 of the Final Act. At the Berlin Conference of 1885, the scope of the Principle of Effective Occupation was heavily contested between Germany and France. The Germans, who were new to the continent of Africa, believed that as far as the extension of power in Africa was concerned, no colonial power should have any legal right to a territory, unless he exercised strong and effective political control. Since Germany was a late comer to the continent and was unlikely to gain any possessions, it had an interest in embarrassing the other European powers on the continent and forcing them to give up their possessions if they could not have a strong political presence. On the other side of the debate was Britain who had large territorial possessions on the continent and was interested in keeping these territories while minimizing it’s responsibilities and administrative costs. In the end, the British view prevailed. The disinclination to rule what the Europeans had conquered is visible throughout the protocols of the Berlin Conference, but especially in The Principle of Effective Occupation. All that a European power had to do was establish some kind of base on the coast and then it was free to expand inward. The Europeans did not believe that the rules of occupation demanded European Hegemony on the ground. In fact, the Belgians originally wanted to include that “effective occupation” required provisions that “cause peace to be administered”, however that amendment was struck out of the final document. This principle, along with others that were written at the Conference allowed the Europeans to conquer Africa while doing as little as possible to control it. The Principle of Effective Occupation did not apply so much to the hinterlands of Africa at the time of the conference. This gave rise to “hinterland theory” which basically gave any colonial power with coastal territory the right to claim political influence over an indefinite amount of inland territory. Since Africa was irregularly shaped, this theory caused problems and was later rejected. Portugal – Britain: The Portuguese government presented a project, known as the “Pink Map” (also called the “Rose-Colored Map”), in which the colonies of Angola and Mozambique were united by co-option of the intervening territory (land that later became Zambia, Zimbabwe, and Malawi.) All of the countries attending the conference, except for the United Kingdom, endorsed Portugal’s ambitions. A little more than five years later, in 1890, the British government, in breach of the Treaty of Windsor (and of the Treaty of Berlin itself), issued an ultimatum demanding that the Portuguese withdraw from the disputed area. France – Britain: A line running from Say in Niger to Baroua, on the north-east coast of Lake Chad determined what part belonged to whom. France would own territory to the north of this line, and the United Kingdom would own territory to the south of it. The Nile Basin would be British, with the French taking the basin of Lake Chad. Furthermore, between the 11th and 15th degrees latitude, the border would pass between Ouaddaï, which would be French, andDarfur in Sudan, to be British. In reality, a no man’s land 200 kilometres wide was put in place between the 21st and 23rd meridians. France – Germany: The area to the north of a line formed by the intersection of the 14th meridian and Miltou was designated French, that to the south being German. Britain – Germany: The separation came in the form of a line passing through Yola, on the Benoué, Dikoa, going up to the extremity of Lake Chad. France – Italy: Italy was to own what lies north of a line from the intersection of the Tropic of Cancer and the 17th meridian to the intersection of the 15th parallel and 21st meridian. The conference provided an opportunity to both channel latent European hostilities towards one another outward, provide new areas for helping the European powers expand in the face of rising American, Russian, and Japanese interests, and form constructive dialogue for limiting future hostilities. For Africans, colonialism was introduced across nearly all the continent. When African independence was regained after World War II, it was in the form of fragmented states. The Scramble for Africa sped up after the Conference, since even within areas designated as their sphere of influence, the European powers still had to take possession under the Principle of Effectivity. In central Africa in particular, expeditions were dispatched to coerce traditional rulers into signing treaties, using force if necessary, as for example in the case of Msiri, King of Katanga, in 1891. Bedouin and Berber ruled states in the Sahara and Sub-Sahara were overrun by the French in several wars by the beginning of World War I. The British moved up from South Africa and down from Egypt conquering Arabic states such as the Mahdist State and theSultanate of Zanzibar and, (having already defeated the Zulu Kingdom in South Africa, in 1879), moving on to subdue and dismantle the independent Afrikaanerrepublics of Transvaal and Orange Free State. Abyssinia (Ethiopia), the only free native state, which fended off Italian invasion from Eritrea in what is known as the First Italo-Abyssinian War of 1889-1896. Majeerteen Sultanate, The Sultanate was founded in the early 18th century, it was annexed by Italy in the 20th century. Sultanate of Hobyo, the Sultanate was carved out of the former Majeerteen Sultanate and ruled northern Somalia until the 20th century, when it was conquered by Italy. By 1902, 90% of all the land that makes up Africa was under European control. The large part of the Sahara was French, while after the quelling of the Mahdi rebellionand the ending of the Fashoda crisis, the Sudan remained firmly under joint British–Egyptian rulership with Egypt being under British occupation before becoming aBritish protectorate in 1914. The Boer republics were conquered by the United Kingdom in the Boer war from 1899 to 1902. Morocco was divided between the French and Spanish in 1911, and Libya was conquered by Italy in 1912. The official British annexation of Egypt in 1914 ended the colonial division of Africa. Germany was defeated.